A Walk in the Woods is a stash buster dream. Make up 12, 20 or 36 blocks to finish one of the three quilt sizes given in the chart above. 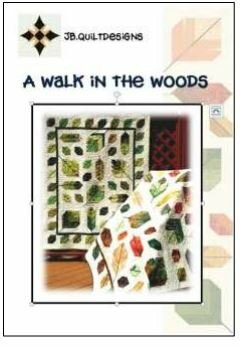 Have fun collecting scrappy strips for the leaves; batiks look great in this pattern but are not essential. Fabric requirements are based on 40” usable width, but partial strips can also be used to add variety to the leaf blocks. Because of this, the number of strips listed in the pattern is only approximate.